Where i click to download this Mod files? Ive ran into a problem. when i install it it does nothing at all. my game is fine. The mods and addons bit on the main menu still wont open and no parts have came into the editor. I think I'm on the right version cause i cant update but my launcher is bugging out. the current and latest version id buttons only have a dash next to them and the background of it is just white. Any help? 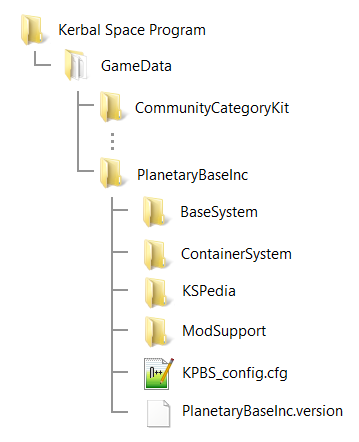 just found that if you go into the folder for ksp and go into the gamedata folder, there will be another one with this mod in it, just take the stuff out of the gamedata folder with this mod's files and move them into the main gamedata folder, if you're using twitch to install mods to ksp. just something I discovered when I was poking around the folders. I am asking as this site (curseforge) now seems to be associated with the twitch mod manager and I like using a mod manager to keep my mods up to date. Is this a bug/do the creates intend to fix this? if it is a bug is this post sufficient or should I 'report' it on the forum thread? Alternatively can someone recommend a better mod manager for KSP? I don't know, try CKAN. Although I personally just drag/drop it to GameData. Why modules for a planetary station do not require electricity? I think they can't work without electricity. Otherwise for what there is a nuclear reactor? Who agree with me? Why doesn't the greenhouse container or planetary greenhouse produce food? All the inputs are available, but the food counter does not go up. I have 1 Greenhouse container for each Kerbal. You have to use the right version of this mod for the right version of KSP. I cannot mark version as only with compatible KSP 1.3.1 because Curse is too slow with updating the available version number of KSP. I can only choose 1.3 as of now. Will mark 1.5.6 for 1.3.1 once it is possible. This looks like a fantastic mod to use later on (I've played KSP for 6 odd years but I'm starting from scratch). I was a big fan of BobCat's base/module packs, which were highly interactive in IVA, but unfortunately all his mods are outdated to the point that those interactive screens, monitors etc. are non-functional. Do these parts have any such interactive stuff, and if not are you planning on making some of them interactive at all?